In this exhibition of new drawings, Aric Obrosey continues to mine the rich tradition of lacework, both for its formal qualities and as a symbol of a bygone economy wherein all consumer objects were laboriously created one by one. For the artist, the lace tradition parallels a personal devotion to the work of the hand as well as a love of detail, complexity and linear structure. 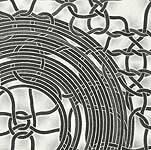 His drawings repeat various gestures derived from lace, such as knots and twists, to form a modular network or background structure known as the "fond" in lace-making terms. From a distance, the meandering pencil lines appear to the viewer as interwoven threads of differing textures. Close inspection reveals that the texture of each thread is actually a finely detailed pattern, either abstract or representational. The content of the patterns suggest industry, mass production, handwork, obsolescence and technological advance. As the threads tangle, twist and come into contact with one another, multiple associations and interpretations are suggested regarding the interplay of culture, technology and handcraft. Obrosey further reinforces his themes by adding an additional layer of representation. In many of the drawings, the individual threads coalesce in the center to form larger objects that can be thought of as recent cultural relics such as a 45 RPM record, a cotton work glove, and a mirrored disco ball. These relics do not appear as solid forms, but rather seem caught in an instant between spontaneous generation and wild unraveling. In a meditative manner, the viewer’s eye follows the threads in and out as they pass by each other, through the larger forms, off the page and back again. The force of Obrosey’s delicate, minute and beautiful marks dawns slowly – he creates Gordian knots hinting at the fabric of society and the inextricably intertwined threads of history, progress and power aided by technology and labor.